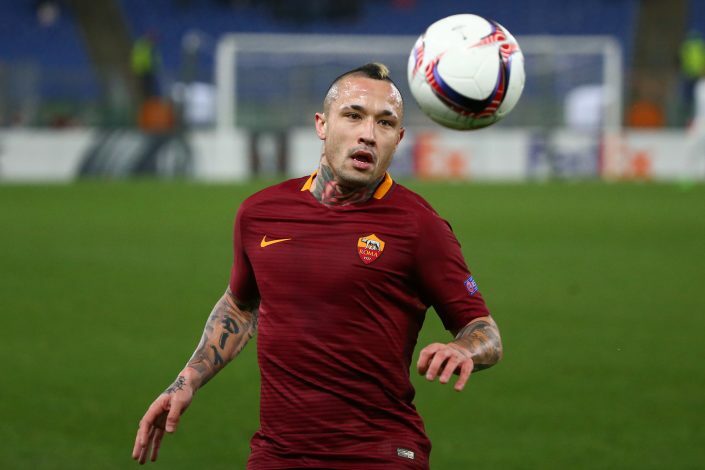 Roma president James Pallotta has confirmed that Radja Nainggolan will not be leaving the club this summer. Nainggolan was among the few midfielders Man United were closely monitoring for a prospective move to Old Trafford, but the English club will now be forced to withdraw its interest, after Pallotti successfully managed to hold on to the star man. The 29-year-old played a major role for the Serie A club last season, as they finished at the second spot in the Serie A table, right behind Juventus. It is understood that Roma have high aims for the upcoming season, and they would need all their best players, including Nainggolan, to fight for the top spot. Pallotta recently announced that the club will not be letting go of either the Belgian International, or their strong defender, Kostas Manolas. Roma’s impressive run in the Serie A has already attracted several eyes towards their players, as they have already lost Leandro Paredes to Zenit St. Petersburg, Antonio Rudiger to Chelsea, and Mohamed Salah to Liverpool. The situation for the Giallorossi seems very akin to that of Monaco, who won the Ligue 1 last season. Since then, they had to let go of several of their top quality players due to high transfer bids from outside their country’s borders. Speaking about the current transfer situation of Roma, Pallotta continued: “We’ve made the sales we had to for Financial Fair Play. [New sporting director] Monchi is doing a great job, we have a common plan and we discuss everything together. Nainggolan is considered to be among the best midfielders to have improved since the past season, and at 29 years of age, many consider this to be his finest period yet. He played 57 games for Roma in all competitions last season, scoring 14 goals and assisting 7 in the process.